Announced at the same time with the S10e, S10, and S10+, the Galaxy S10 5G is the only handset in Samsung's new flagship smartphone series that can't be bought yet. While the Galaxy S10 5G is scheduled for launch on April 5 in South Korea (Samsung's home country), there's been no word on the phone's release date for the US market. Well, not until today. According to ever-reliable Evan Blass, the Galaxy S10 5G should be launched by Verizon Wireless on May 16. For the beginning, the new smartphone will be a Verizon-exclusive device (with other major carriers expected to sell it later in 2019), so we'll definitely not see it on the market before May. Earlier today, Verizon officially launched 5G mobile services in the US, albeit only in two cities: Chicago and Minneapolis. By the end of 2019, the carrier plans to offer 5G services in over 30 markets nationwide, so folks buying Samsung's 5G-ready Galaxy S10 will have various places where to take advantage of its speedy data transfer capabilities. Theoretically, 5G lets you achieve data transfer speeds of up to 1 Gbps (Gigabits per second). While you can't really reach that in real life, download and upload speeds will be faster than on 4G - up to about 20 times, according to Samsung. 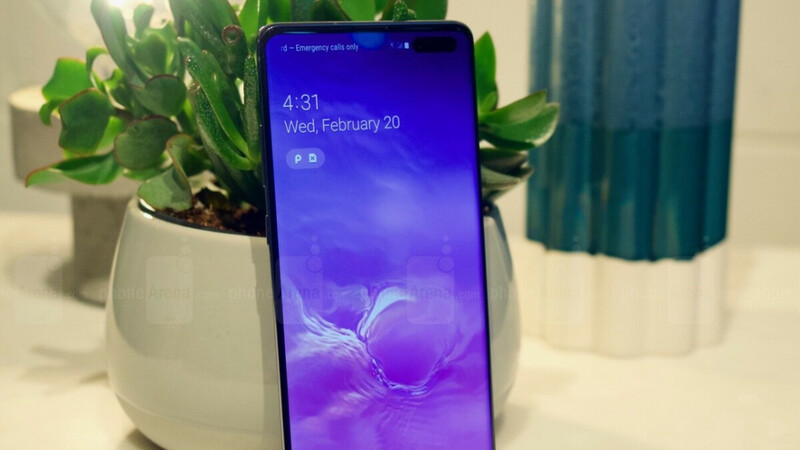 There is still no word on how much the Samsung Galaxy S10 5G - pictured above and below - will cost stateside. But, since the handset is expected to be available starting at around $1,200 in Korea (256 GB model), it's likely that its US price won't be much different. In other words, a Galaxy S10 5G 256 GB could be about as expensive as a Galaxy S10+ 512 GB (currently priced at $1,249 in the US). In South Korea, for a limited time after launch, the Galaxy S10 5G will be sold alongside some gifts, including a free pair of Galaxy Buds earphones and a free wireless charger. We're assuming that Samsung plans to offer gifts to US buyers, too, but we don't know how or if these will differ from those in South Korea. While the Galaxy S10 5G isn't too different from the other members of Samsung's S10 series, it is the most advanced Galaxy S smartphone ever made, and its 5G capabilities obviously have a lot to do with that. Another thing that's exclusive to the Galaxy S10 5G is its rear camera - this includes the triple camera of the S10+ as well as a special 3D Depth Camera (useful for bokeh effects in videos and for augmented reality applications). The Galaxy S10 5G is powered by the same Qualcomm Snapdragon 855 processor that can be found inside all other S10 phones sold in the US - paired with 8 GB of RAM, this processor will certainly deliver a top-notch performance. But the S10 5G is larger than the other S10 models, including the 6.4-inch S10+. That's because the S10 5G sports a 6.7-inch display with 1440 x 3040 pixels - the biggest screen in any Galaxy S device to date. The super-sized display of the Galaxy S10 5G is accompanied by a battery to match it - a 4,500 mAh one. Again, this is the largest battery of any Galaxy S ever, although it remains to be seen how long it can last on a single charge. The S10 5G further features stuff like a dual front-facing camera, dust- and water-resistance, a standard 3.5mm headset jack, and microSD card support. In South Korea, the Samsung Galaxy S10 5G will be available in three color variants: Majestic Black, Royal Gold, and Crown Silver. It's unclear if all are bound for the US, but we'll be here to let you know when we find out. Why buy this when you can wait for the Note 10 and have better specs for the same price. Let's not kids ourselves. The Note 10 will have basically the same specs as this. That's not necessarily a bad thing, but it won't add much if anything. I was planning on getting this, but it's a Verizon exclusive and I'm loyal to T-Mobile. I can't buy the international version I don't think because I believe that Samsung pay doesn't work with those and my main reason for sticking with a samsung phone. I really wish the Galaxy Fold wasn't so freaking ugly, I'd get that. But the Mate X looks so much better.